Live Event fans have more power and alternatives to choose from than ever before. They can make or break live event organizers. So what can set you as an organizer apart from other fierce competitors? How can you keep attendees loyal and make them return to the events you are organizing? According to a Walker study, by the year 2020, the quality of customer service will be of greater importance than price or product offering. Building and maintaining good relationships with your customers, i.e. event attendees, is key to a growing business. What makes fans trust you as an organizer and make them keep coming back to your events? Well, they need to know you are hearing them and taking their opinions into account. Fans love feeling valued and sharing their insights. They like to engage in your attempt in increasing the value of the events you are offering. Building emotional bonds with the fans is essential. They want to know they are talking to real people who are acknowledging them rather than an organizer that will make them feel anonymous. By engaging with your attendees on a regular basis, their experience will improve, and the process will feel more personal. By creating an emotional connection with the attendees, you will keep them loyal to you as an event organizer. By carefully listening to the attendees and taking their opinions into account, they will feel personally involved in your business. Showing that you value their input and want them to involve is essential for you as an event organizer. Feedback from attendees is an excellent tool for insights. Not only will their feedback give you ways to improve, but it will also always give you brand new ideas. You learn who the event-goers are and how you can satisfy their needs in the best possible way. By listening to your fans thoughts you have the possibility to improve your offering as an event promoter concerning products, services, communication and innovation. Both positive and negative feedback is insightful. It clarifies what needs improvement in your business and/or what should be stressed, which will often give you fresh ideas. Analysing the thoughts of the attendees will enable you to see what is currently not working, and find ways to make the event-goers’ overall experience better. It will help you address the current issues at stake and create action plans. The comments from the attendees will provide you with informed business decisions. After all, they are the ones you created your business for. It is essential to create products or services not only made for them, but made by them. By establishing an fan feedback loop, keeping in contact with them with the right timing and continuously making changes through what you learnt, you ensure you will be at the forefront among live event organizers. Event-goers’ loyalty to you is priceless. According to a study, it is 5 to 25 times more expensive to acquire a new customer than it is to keep a current one. Nurturing your long lasting relationships with event-goers and improving their journey is therefore essential. Retaining customers is less costly than acquiring new ones. Actively seeking feedback will create a more personal relationship. It shows that you care about the event-goer’s experience. When you build a stabile and positive relationship with your attendees, they will be loyal. Which, in return, will create more ticket sales. You will grow from being a organizer that sells tickets to events, to a organizer that genuinely cares about the event goers’ personal experience throughout their journey. 90% of customers believe brand recommendations from friends and people are 4 times more likely to buy when referred by friends. Word of mouth marketing is the best possible way to grow your audience as well as the number one method to acquire new attendees to your events. Another way of growing your word of mouth is by asking for online reviews. According to a data collection made by Invesp, 90% of consumers read online reviews before visiting a business. And 88% of consumers trust online reviews as much as personal recommendations. Online reviews should not be underestimated as they can easily help you acquire new attendees. When attendees have an emotional bond with you as an organizer or to the events you are offering, they are more likely to refer you to others. As an organizer of live events, you have a pre-advantage over average consumer good. Great live experiences generate great emotions, and is what has the greatest impact on whether or not a customer will choose to make a referral. 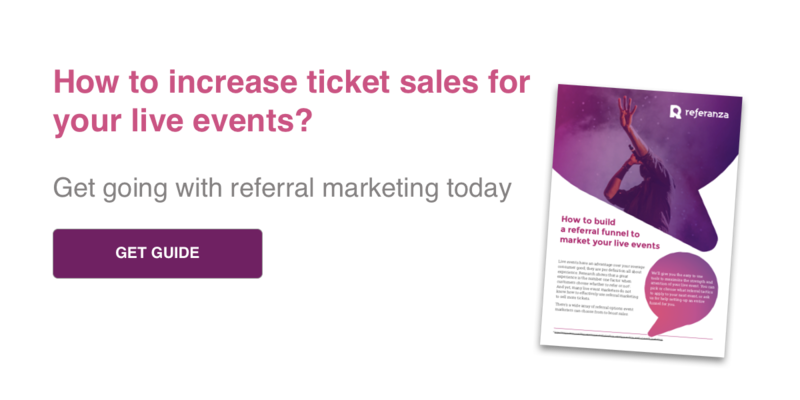 If you haven’t already implemented referral marketing into your marketing toolbox, we’ll gladly introduce you to different tactics on how to do so in our guide How to build a refer-a-friend funnel to market your live events.